The corneal reflex (afferent sensory CN V) is examined along with the blink reflex (efferent motor CN VII) in order to minimize repeated patient exposure to the stimulus instrument, and because the testing procedure is the same for both tests (pictured to the right). 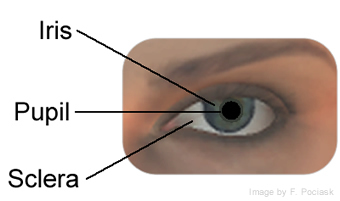 The examiner will test for both afferent sensory and motor responses by observing whether the patient perceives the stimulus (sterile cotton swab or wisp of cotton) and concurrently blinks in response to the light touch against the sclera portion of the cornea/eye (pictured below). 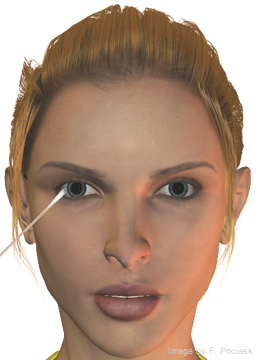 The patient can look away from the area where the stimulus is applied to help avoid contact with the pupil and iris.